Since developing and validating SETALUM, a versatile vascular sealant in 2013, closely-held, Paris-based Gecko Biomedical is now poised to seek FDA approval for SETALUM, validate new programs, and open a state-of-the-art manufacturing facility in Northern France. “As a company, we are at a tipping point,” Christophe Bancel, founder and CEO, says in an interview with BioTuesdays. “Our platform is ready for acceleration in very diverse directions. We launched as a vascular sealant company, but we are expanding as a tissue reconstruction company with a fully industrialized polymer platform that can be used in a variety of medical device applications, and produced en masse,” he adds. Mr. Bancel explains that Gecko’s technology is based on world-class research and intellectual property from the laboratories of Professor Robert Langer, MIT, and Professor Jeffrey M. Karp, Brigham and Women’s Hospital, who co-founded Gecko in 2013 along with himself, and Bernard Gilly of iBionext Network. Polymers are materials made of long, repeating chains of molecules, and have unique properties depending on the type of molecule being bonded, and how they are bonded. “In our case, our platform is composed of fully synthetic, light activated polymers that can be ‘printed’ on living tissue inside and outside the body,” he points out. Once in place, they polymerize into a solid yet flexible state when the surgeon decides. In addition, they are bioresorbable and fully hydrophobic so they don’t become diluted in wet environments, he adds. The polymers are activated using Gecko’s proprietary blue light activation pen for on demand curing. Once printed, the polymers are biodegradable, biocompatible and elastic, complying with the dynamics of the tissues on which they have been printed. 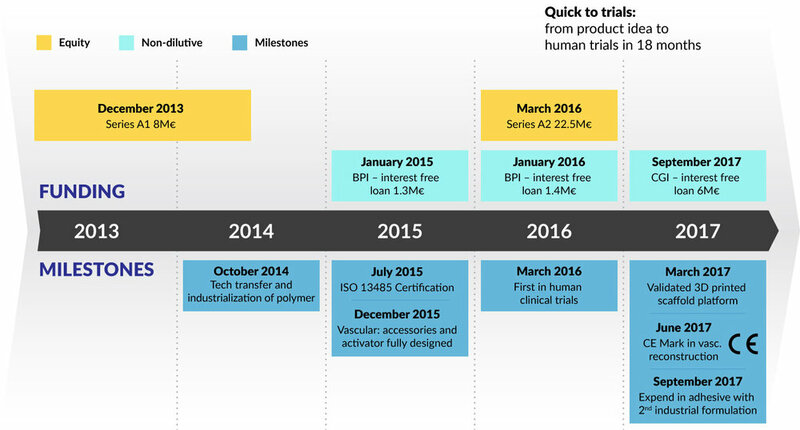 “We chose the vascular sealant space to launch our first product entry because we knew we would be successful within a short amount of time, but our polymers can be leveraged in so many different ways that support the extension for applications with different tissue types, such as cardiovascular, bone, nerve, ophthalmological and urological,” Mr. Bancel says. SETALUM, an add-on to sutures during vascular surgery, received CE Mark in June 2017, paving the way for further development of other indications such as using it as an adhesive, a barrier, a filler, and as a frame or scaffolding by combining it with 3D printing technology, Mr. Bancel says. Gecko is currently undergoing the FDA premarket approval process for SETALUM and anticipates filing an investigational device exemption by the end of 2018, with clinical trials beginning in 2019 in the U.S.
“Our polymers are made up of three monomers and you can play with the ratio so different proportions can lead to distinct properties,” Mr. Bancel says. “The versatile design allows for each use case to leverage the right formulation, distinct delivery device, and specific activation technology to solve individual, unmet medical needs,” he adds. In order to meet the demand of the expansion and industrialization of Gecko’s polymers platform, Mr. Bancel says the company is currently in the process of running validation tests and protocols on a globally unique, state-of-the-art manufacturing site in Roncq, France, to be certified by the end of 2018, and that will facilitate the production of any version of the polymer. He describes the facility as 100% green powered space that features four clean rooms and an analytical laboratory. “Cutting-edge processes will be performed at the site to produce all our liquid polymers in individual, sterile conditions, ready for use by surgeons,” Mr. Bancel reveals. “We also intend to speed up a second phase in our strategy through the industrial and clinical development of our polymers as a biomedical resin, as well as by optimizing state-of-the-art 3D printing techniques,” he adds. Looking forward, Mr. Bancel describes the rapid expansion of Gecko’s portfolio of products using a standardized process that he calls the Innovation Hub to bring innovative solutions for patients. In fact, it’s a sophisticated business model that allows Gecko to swiftly transition from an idea, to proof of concept, to full device specifications in order to begin first-in-man trials in less than two years from the start of the process, he explains. The Innovation Hub not only supports product development that takes place internally but it also supports potential product development that may occur from strategic partnership. 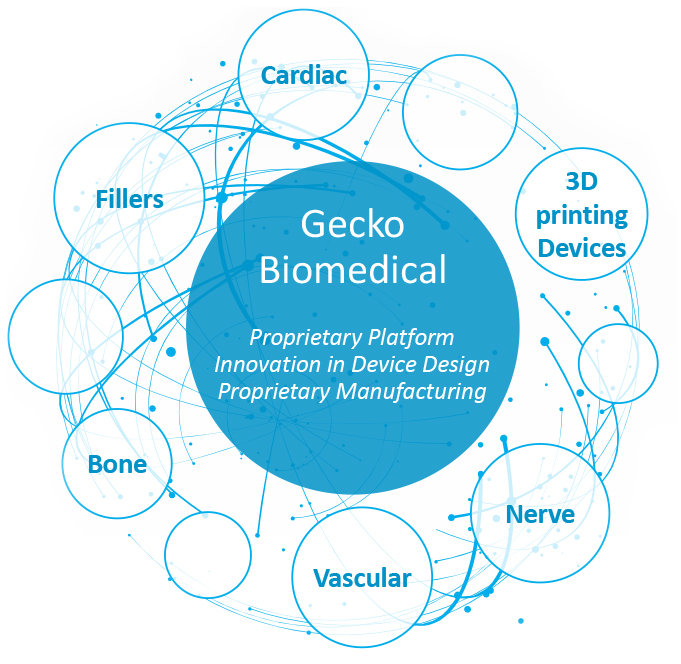 “As a result, Gecko becomes an open R&D ecosystem on a proprietary technology that designs for third parties from small start-ups to larger medtechs,” Mr. Bancel contends. “We have a fully proprietary platform, but we want to open it up to the innovators of the world – from surgeons to large medical device companies, to produce innovative solutions, co-design products, and ultimately provide a better quality of life for patients worldwide,” he adds. Since Gecko received regulatory validation in the form of CE Mark last year, they have proceeded to expand their portfolio with greater speed, putting the Innovation Hub into full swing. “We are very optimistic about the vast potential of our product development with extended novel applications in other fields of tissue reconstruction such as guided tissue repair, and in the field of localized drug delivery,” he adds. To connect with Gecko, or any of the other companies featured on BioTuesdays, send us an email at editor@biotuesdays.com.